STEPHEN KOTOWYCH is a Writers of the Future Grand Prize winner (for “Saturn in G Minor”) and past finalist for the Prix Aurora Award, Canada’s top SF prize. 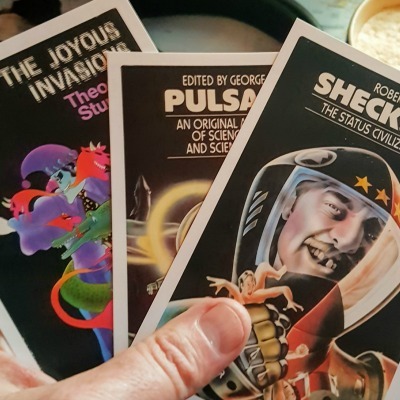 His stories have appeared in StarShipSofa (#259), Interzone, Intergalactic Medicine Show, numerous anthologies, and been translated into a dozen languages. Stephen is currently completing work on his first novel–a secret history about the real-life friendship between Mark Twain and Nikola Tesla. He enjoys guitar, tropical fish, and writing about himself in the third person. Nick is an actor, audio-book narrator and voice-overer. He recently did a few scenes on the telly with Derek Jacobi, which made him tingle. He’s just finished shooting the feature film ‘Slapper and Me’, which mostly involved him sitting in a sleazy pub for 12 hours a day smoking herbal cigarettes, drinking tepid, non-alcoholic ale and pretending to be in the 1970’s. He thinks it should be out in the autumn, but they’re not telling him, probably because they don’t want him turning up at the première in his cheap suit. Audio-bookwise, Nick is currently four books into narrating the mystery/thriller ‘Eddie Malloy Series’, written by Richard Pitman and Joe McNally. Set in the skullduggerous world of horse-racing, reluctant part-time detective Eddie gets involved in various capers and generally solves stuff. It’s the first time in many a year that Nick has read, and enjoyed, a set of novels where spaceships refuse to appear. Notwithstanding, Nick has made a polite suggestion to the authors that shiny, future-type stuff might feature in the next of the series (a Hawking-drive, killer robot horse, perhaps). This has fallen on deaf ears.